Last July, 2013, I recorded a video interview with Anthony Meno, who was the store manager at Pacific Paintball from late 1991 until January 1995. Over the last month I’ve been finishing up these cuts and will start posting them this week. Pacific Paintball was later known as Kapp, but as Sean Scott told me, their actual business remained listed under Pacific Paintball. 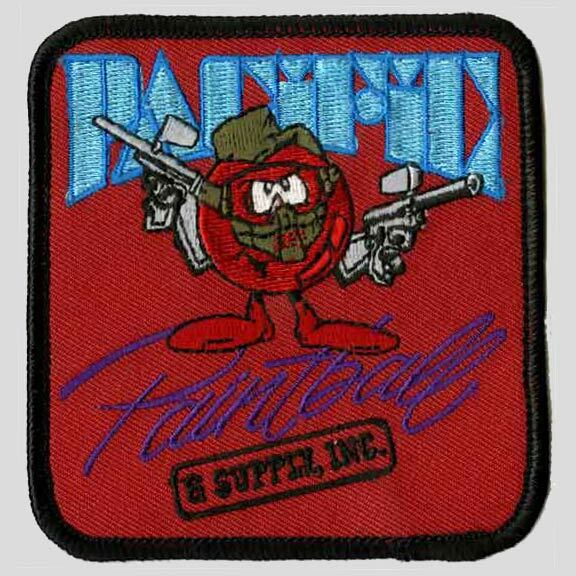 Pacific Paintball & Supply patch c. early 1990s. Run by owners and step brothers, Chris Haggin and Richard Mansfield, Pacific Paintball was my local paintball store in the North Bay (Northern California) and I’ve always been a fan of their custom Autocockers. In around 2003 (or so?) I responded to an online airgun forum ad post mentioning paintball items for sale and met Tony Meno who wanted to get rid of some of his junk from his storage unit in Santa Rosa. 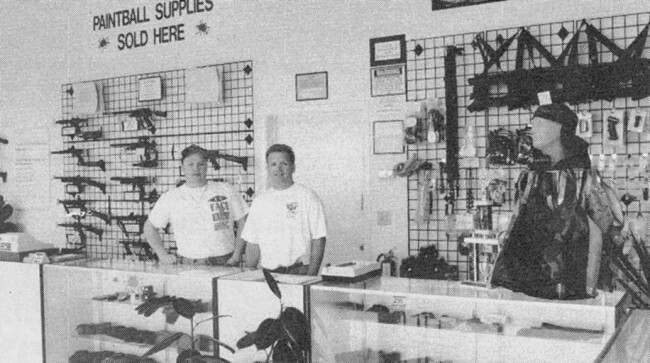 Pacific Paintball Owners, Chris Haggin (left) and Richard Mansfield (right) as picture in this scan from the January 1993 APG write up on Pacific Paintball. Serrations” aka Shark Gills on early Razorback Autocockers. During these early years is really when Pacific Paintball jumped ahead of the competition and made a name for itself in Autococker modifications and started doing base customizations on cockers they would sell to tons of companies/distributors nationwide. An early base model Pacific Paintball Autococker with a modified trigger, LPR detent, 3 way and J and J hard chrome barrel. But printed information on Pacific Paintball from the time Tony worked there is difficult to find. I have come across a few small bits though including this scan from the January 1993 issue of Action Pursuit Games. Full article on Pacific Paintball scanned from the January 1993 issue of Action Pursuit Games. Click to enlarge. As the article states, “A full-time airsmith on-site corrects large or small gun problems, and Pacific Paintball also does a variety of custom paintgun work, including color anodizing, custom built parts, and trigger work.” This would quickly summarize Tony’s position at Pacific during that time. From what I understand, Tony, Chris Haggin and, maybe during 1994, Billy Wing would be the airsmiths doing the modifications. Tony’s interview segments will start to go online later this week and I’ll slowly be putting up articles to go along with them with more Pacific Paintball related media.